You get the same performance level of energy that is achieved by the standard monocrystalline and polycrystalline solar panels without the weight and permanence, so that you are not tied down to one place and can have electricity whenever and wherever you need it. Flexible solar panels are portable, lightweight and easy-to-use while producing the solar energy you need. When connected to battery/batteries, a controller and an inverter you can achieve the same performance level of energy that is acquired by the standard monocrystalline and polycrystalline solar panels without the weight and permanence, so that you are not tied down to one place and can achieve the purpose that you intend. 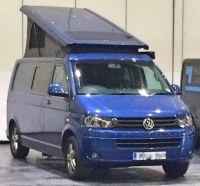 Can be used for your home, business, travels, electric car, electric bike, camper, food truck, boat, yacht, delivery vehicle, DJ equipment, street food cart, RV’s, Trade Show Booth, Aurora Carport LED Lights and so many more options. Great for use while traveling because of its adaptability. 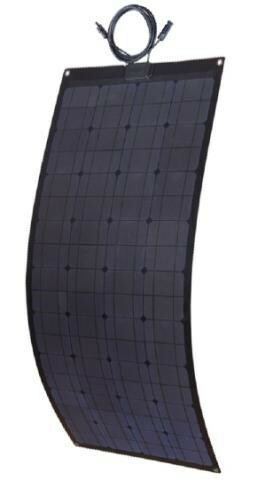 Portable, thin and flexible solar panels are lightweight and incredibly durable solutions for traditional and non-traditional solar panel needs, such as powering your lights, appliances, radio, laptop, smartphone, travel refrigerator, DJ equipment, Bounce House, tools, work vehicle, electric bike, electric motorcycle, outdoor and indoor events and on-site construction equipment. 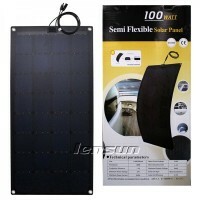 Note: Please do not reverse bend the flexible solar panel when you receive it and install it. When the solar panel bends backwards, the solar cells may be damaged from stress concentration on the cells, and solar panels output current will reduce. Flexible solar panels are portable and easy-to-use while producing the solar energy you need. 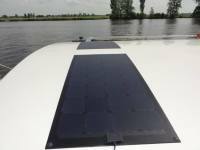 Solar panel can be curved to a 20-30 degree angle and easily mounted on an RV, boat, cabin, tent, or any other irregular surface. Perfect for curved roofs and surfaces where bonding is possible. 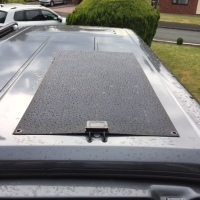 Panels can also be secured by bolts or screws for further stability.